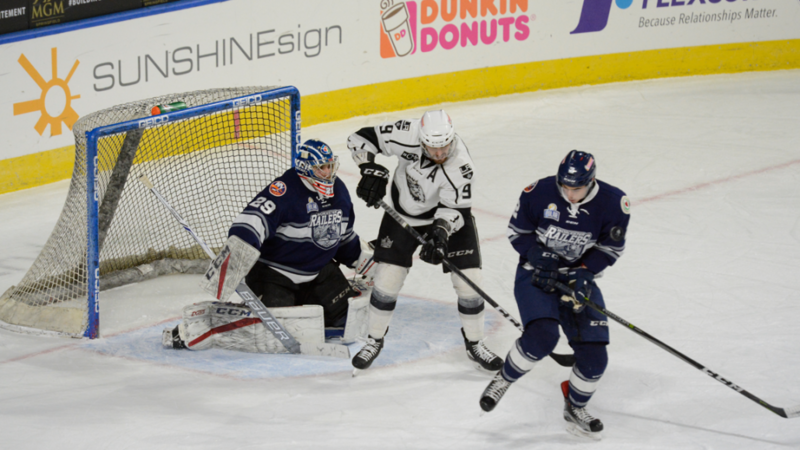 Worcester, MA – The Worcester Railers HC(37-27-4-4, 82pts) closed out the regular season with a 2-0 loss to the visiting Manchester Monarchs(41-25-3-3, 88pts) in front of 7,191 fans at the DCU Center on Sunday afternoon. The Railers will face the Adirondack Thunder in the first round of the Kelly Cup playoffs which will begin Friday, April 13 at 7pm at Glens Falls, NY. Sam Kurker and Michael Doherty scored for the Monarchs as Will King made 25 saves in net for the Railers. Worcester had a season high six straight game win streak snapped as Evan Cowley made 24 saves in net for Manchester. Neither team found the back of the net in the opening frame with the only real excitement occurring at 10:14 as Frankie DiChiara (2ndFM) dropped Jake Wood with a series of rights after a high hit on Matt Lane at center ice. Shots were 7-4 in favor of Manchester through 20 minutes of play. Manchester got on the board at 16:08 of the second period after a perfect shot by Sam Kurker (12th) from 25 feet that hit the crossbar and into the net. Yanick Turcotte picked up his 20thfighting major with a long tussle by Tony Turgeon at 17:19. Shots were 20-16 in favor of Manchester though 40 minutes as the Railers trailed 1-0 through two periods of play. The Railers thought they had tied the game late in the third period as the red light went on after a goal mouth scramble, but after a brief discussion it was ruled no goal. Michael Doherty (20th) scored an empty netter at 18:39 to give Manchester a 2-0 road victory. The first 1,000 fans at all home playoff games will receive a Railers HC rally towel presented by Energy Monster. Fans can score $5 Bud Lightsin the Bud Light Lounge at all home playoff games. Family Fun Packswill be available for all home playoff games which include four tickets, four hot dogs, and four sodas for just $80. Individual tickets start at just $15. Call 508-365-1750 or visit www.RailersHC.com. The Railers Tavern, located behind the DCU Center provides hockey fans with a great pregame and postgame atmosphere all season long. Watch all road games broadcast live at Railers Tavern or watch on ECHLTV.com for a small fee. Listen to all Worcester Railers playoff games live on 98.9 Nash ICONwith coverage beginning 30 minutes before puck drop with Eric Lindquistand Tom Matthews. Full season memberships for the 2018-19 season, mini plans, and group tickets are on sale now by calling the Railers front office at 508-365-1750 or by visiting www.RailersHC.com.